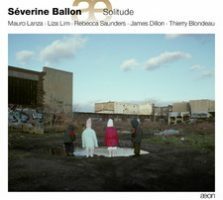 “Solitude.” Rebecca SAUNDERS: Solitude (2013). Mauro LANZA: La Bataille de Caresme et de Charnage (2012)*. James DILLON: Parjanya-Vata (1981). Liza LIM: Invisibility (2009). Thierry BLONDEAU: Blackbird (2013). Séverine Ballon (vlc), Mark Knoop* (pno). Aeon AECD 1647 (1 CD) (http://www.outhere-music.com/). In most music, the cello’s four strings keep to the standard pitches. Pieces requiring retuning or scordatura have a modest foothold in the literature. It is very unusual to encounter works where strings are adjusted while playing, but several specimens fill out Ballon’s bold recital. Saunders’ Solitude commences with a lowered C string (an octave lower than usual) which exposes a bouquet of colors as activity and tessitura increase. With sounds similar to Solitude, Lim’s Invisibility is a racing yacht compared to Solitude’s determined icebreaker. Black Bird by Blondeau also starts below customary tuning as if deep in the earth. There is also a second bow with hair wrapped around the stick. Figurations eventually suggest the animal world, and towards the end, a tape introduces actual bird song. Lacking extreme detuning, percussive effects and tape, Dillon’s Parjanya-Vata wouldn’t otherwise be the oldest or most conventional item. Lanza’s La Bataille de Caresme et de Charnage asks for cello and piano but both instruments are prepared and the players also have noisemakers. La Bataille comingles raspy grinding (a timbre strongly associated with Lachenmann), prepared piano sounds, vocalizations and percussion. Most of the work is hushed despite whistling and a gradually building manic dance. Even considering the inspiring Breughel work (The Fight Between Carnival and Lent), this comes off as a very serious parody as indulgency (Carnival) and fasting (Lent) battle it out. 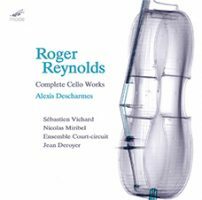 “Roger Reynolds: Complete Cello Works.” Roger REYNOLDS: Thoughts, Places, Dreams (2013)1; Colombi Daydream (2010)2; Focus a beam, emptied of thinking, outward… (1989)3; imagE/cello (2007)4; imAge/cello (2007)5; Process and Passion (2002)6; A Crimson Path (2000-02)7. Alexis Descharmes1,2,3,4,5,6,7 (vlc), Ensemble Court-circuit1, Jean Deroyer1 (cond. ), Nicolas Miribel6 (vln), Frédéric Voisin6 (electronics), Sébastian Vichard7 (pno), Roger Reynolds (speaker). mode 277/78 (2 CDs) (http://www.moderecords.com/). This significant double-set offers all of Reynolds’ cello works ranging from the compact contrasting solos imagE/cello and imAge/cello to heftier works requiring accompanying ensembles. Process and Passion for violin, cello and computer-processed sound attracts immediately with intense details. Descharmes invests totally in these pieces of “delightful strangeness,” having closely collaborated with Reynolds for several years. Also included are the composer reading the influencing texts: James Merrill for the solo Focus a beam, emptied of thinking, outward… and Aeschylus for Process and Passion and the cello-piano duo A Crimson Path. Colombi Daydream derives structure and mood from one of the earliest known cello works, Giuseppi Colombi’s Chiacona, and is one of 31 multi-composer variations, “Mystery Variations,” commissioned for Anssi Karttunen’s 50th birthday. 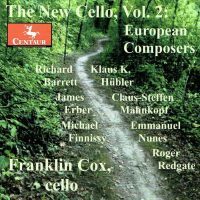 “The New Cello, Vol. 2: European Composers.” Roger REDGATE: Feu la cendre (1992). Klaus K. HÜBLER: Opus breve (1987). Emmanuel NUNES: Einspielung II (1980). Michael FINNISSY: Dove’s Figary (1976-77, 1981). James ERBER: le colonne d’Ercole (1996). Claus-Steffen MAHNKOPF: La vision d’ange nouveau (1997-98). Richard BARRETT: Dark Ages (1987-90). Franklin Cox (vlc). Centaur CRC 3390 (1 CD) (http://www.centaurrecords.com/). Cox drives a tour through ornery but energized solo cello compositions from last century’s end. A composer himself, Cox gravitates towards New Complexity, which isn’t to say that these pieces are inherently difficult to enjoy, just that they are bursting with activity that can stretch a performer’s capabilities. We hear plenty of microtones, seemingly uncoordinated left and right hands (Hübler’s Opus breve), and two bows at once (Barrett’s Dark Ages) to cite just some of the required techniques. Effort is mandatory to sort through these, but Cox is an admirable advocate. 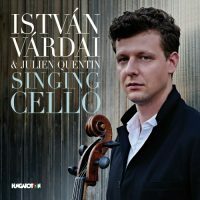 “Singing Cello.” Var. comps. István Várdai (vlc), Julien Quentin (pno). Hungaroton HCD 32741 (1 CD) (http://www.hungarotonmusic.com/). You could argue that there’s plenty enough cello and piano repertoire and so why trespass into vocal music? But then a cogently organized program such as this arrives to make the case for transcribing songs for cello. Included are some pieces meant for cello and piano such as Rachmaninoff’s precocious Op. 2, Suk’s Serenade, Op. 3, No. 2, and Mendelssohn’s Albumblatt, alongside several arrangements already part of the repertoire: Fauré’s Après un rêve, Liszt’s Romance oubliée, Kreisler’s Liebeslied, and the biggest entry, de Falla’s Suite Populaire Espagnole. The surprises include two well-stated Mahler songs, Die zwei blauen Augen and Ich hab’ ein glühend Messer from Lieder eines fahrenden Gesellen, and four Schumann songs from Liederkreis, Op. 39: Mondnacht, Auf einer Burg, Wehmut and Zwielicht. Initially I winced because the Rachmaninoff followed the perfect Mahler, but Várdai’s expression and understanding won me over. “The Franchomme Project.” Auguste FRANCHOMME: Var. comps. Frédéric CHOPIN: Var. comps. (arr. FRANCHOMME). Louise Dubin, Julia Bruskin, Sæunn Thorsteinsdóttir, Katherine Cherbas (vlc), Hélène Jeanney, Andrea Lam (pno). Delos DE 3469 (1 CD) (http://www.delosmusic.com/). Back in the day, Chopin’s friend and colleague Franchomme (1808-84) was France’s most famous cellist. Chopin wrote his cello sonata for him and Franchomme made numerous arrangements of his friend’s music. 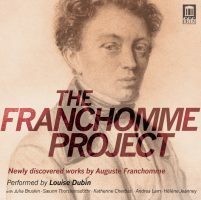 Until Dubin’s efforts, some of Franchomme’s more unique music had fallen out of view. This sampling includes original pieces and arrangements for cello with piano, cello duo and cello quartet. It’s momentarily strange, then enchanting to hear Chopin thus arranged. Four cellos provide Ballade No. 2, Op. 38, the E-Major Prelude, Op. 28, No. 9, and the Funeral March from the Second Piano Sonata, and a cello part is added to the Mazurka Op. 33, No. 3 and the Introduction and Polonaise Brilliante, Op. 3. The four-cello arrangements are the most striking. Of Franchomme’s own music, the cello duets (Franchomme’s own transcriptions of cello-plus-piano works) are especially durable, specifically the Nocturnes, Op. 14, No. 1, and Op. 15, Nos. 1-3, and two Caprices (Nos. 1 and 9) from Op. 12. Dubin offers several occasional items, an Op. 18, No. 3 solo, and a caprice on themes by Weber (Op. 24, No. 2). Cello ensembles can be rare (except as pedagogical teacher-student efforts), and it is wonderful to hear such gorgeous mellowness. “Cello Music from Austria-Hungary.” Ludwig van BEETHOVEN: Sonata in A major, Op. 47, “Kreutzer” (1803; arr. Carl CZERNY, 1822; arr. Auguste FRANCHOMME, 1867). Artur SCHNABEL: Sonata for solo cello (1931). Emanuel MOÓR: Ballade in E major, Op. 171 (1913). Samuel Magill (vlc), Beth Levin (pno). Navona Records NV6024 (1 CD) (http://www.navonarecords.com/). Magill’s program is unconventional no matter how you look at it. The Beethoven transcription holds close to the original, whose violin part was adapted by Czerny and then enhanced by Franchomme. (It’s a coincidence that Franchomme scores twice on these pages, but once spied, he’s everywhere.) The original Kreutzer capitalized on original dedicatee George Bridgetower’s innovative style of violin playing using a Tourte bow, which in our modern age transfers well to cello. It’s not every day that we get to hear this well-worn sonata from a new angle, and Magill and Levin do relish the chance to dress differently. 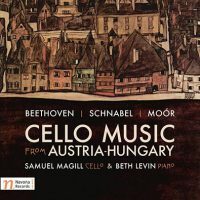 Magill is vivacious in Schnabel’s rhapsodic and beastly solo cello sonata. As much as I admire Schnabel’s fearless, gnarly music, there is still the sense he wrote pages without turning back or thinking of a large-scale or any cyclic structure. Fortunately, the four movements are individually distinctive, and they do not drag despite their sobering atonality. Moór’s name is forgotten, and his invention, the double-manual piano, is obscure. The Ballade’s Romantic piano figurations recall Brahms although the soaring cello suggests Saint-Saëns. The central section discovers unexpected chromatic tunnels and tenor lines. “Transcriptions & Paraphrases.” Franz LISZT: Hungarian Rhapsody No. 1 (1851; arr. KOSTOV/VALKOV, 2015); Hungarian Rhapsody No. 2 (1851; arr. KOSTOV/VALKOV, 2011); Evocation á la Chapelle Sixtine (1865; arr. KOSTOV/VALKOV, 2015). Buxton ORR: A Carmen Fantasy (1985). Bohuslav MARTINŮ: Variations on a Theme of Rossini (1942). Mario CASTELNUOVO-TEDESCO: Figaro (1945). Lachezar Kostov (vlc), Viktor Valkov (pno). Navona Records NV6007 (1 CD) (http://www.navonarecords.com/). On this disc of bright arrangements and transcriptions, the most interesting is the atmospheric Evocation. 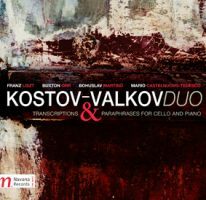 In Liszt’s original, themes of Allegri and Mozart materialize from a contemplative haze which Kostov and Valkov dramatize through what sounds like subtle panning. Orr’s Carmen Fantasy touches upon the familiar themes of Bizet’s opera. Similarly, the duo’s arrangements of two Hungarian Rhapsodies emphasize melody, and in the more recognizable No. 2, they exuberantly deliver the potboiler’s tunes. Rossini is at the heart of both Martinů and Castelnuovo-Tedesco’s fantasies. Both are cast as encores, the lively Castelnuovo-Tedesco especially. I am reminded of Finnissy’s aggressive paraphrases which distort and smudge, and to that end, these transcriptions deviate just enough from their targets to appeal to the adventurous. 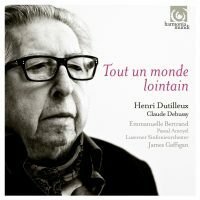 Henri DUTILLEUX: Trois Strophes sur le nom de Sacher (1976, 1982)1; Tout un monde lointain (1967-70)2. Claude DEBUSSY: Sonate pour violoncelle et piano (1915)3. Emmanuelle Bertrand1,2,3 (vlc), Pascal Amoyel3 (pno), Luzerner Sinfonieorchester2, James Gaffigan2 (cond.). Harmonia Mundi HMC 902209 (1 CD) (http://www.harmoniamundi.com/). Entwining Debussy and Dutilleux is amply sensible. The Trois Strophes burst with color and invention; one expects an orchestra to materialize out of the solo cello’s grand cascades. Positioned after Trois Strophes, Debussy’s Sonate elucidates Dutilleux’s ancestors. The Sonate, one of the few completed of a projected series of six, is realized here as modern and mysterious. Dutilleux’s genius is overlooked in the 21st century as he preferred warm tonality and avoided strident dissonance. There are cello concerto passages that could be Messiaen or Grisey for their unique chords and precise harmonies. Bertrand is completely at home, alternately serious and playful. Dutilleux never worked quickly: Rostropovich commissioned the concerto in 1961 but did not see the Baudelaire-inspired score until 1970.